Travel through Scottsdale, AZ with your group in an updated charter bus rental. For any group travel in Arizona, you can depend on Champion Charter Bus to make the process fast and easy no matter the occasion or destination. Our 24/7 team is ready you help you when you call us at 480-626-4771. Champion Charter Bus is your go-to resource for reliable charter bus rentals in Scottsdale and the rest of Arizona. We’ve helped hundreds of groups organize transportation for their corporate events, school trips, sports teams, weddings, private vacations, and more. Choose from a variety of top-rated amenities for a comfortable ride, like plush seating, flat-screen TVs, WiFi, power outlets, and more. We service major cities across the Western United States, including Phoenix, Denver, Las Vegas, Los Angeles, San Diego, San Francisco, and more. Ready to get started? Call us anytime at 480-626-4771. With a buzzing nightlife and hotel scene, visiting Scottsdale is always better with a group. But without efficient, easy travel throughout the city, your private trip can quickly become stressful. With a personal charter bus rental dedicated to your group, the possibilities are endless. If you’re an outdoor enthusiast, pack your bus up with hiking gear and head to Camelback Mountain. Your bus driver will take care of navigating new roads, finding parking, and facing any traffic. If you’re planning a night out in the town at Rockbar Inc., rely on a personal minibus rental to safely transport your group all night without nominating an unwilling friend as the designated driver. Transporting groups for large-scale events can be stressful as you try to keep each attendee organized and on time. Champion Charter Bus offers streamlined transportation solutions for events of all types, like weddings, corporate events, military and government functions, and more. We’ll help you arrange transportation tailored to your occasion so you can focus on planning a seamless event. For trade shows, conventions, conferences, and other corporate events, it’s important to keep clients, employees, and other attendees organized and on schedule for a successful event. You can request an all-black bus for a completely professional look with amenities like reclining seats, air conditioning, WiFi, and power outlets for comfort and productivity on the road. Don’t let transportation be something to stress over on your wedding day. Champion Charter Bus can match you with a stylish bus rental to shuttle guests and your wedding party to and from their hotel to your event at a venue like The Clayton on the Park. Let everyone celebrate your union without worrying about finding your venue, securing parking, arriving late, or missing out on a few drinks. Gone are the days where students have to cram into an old, uncomfortable school bus for school events. 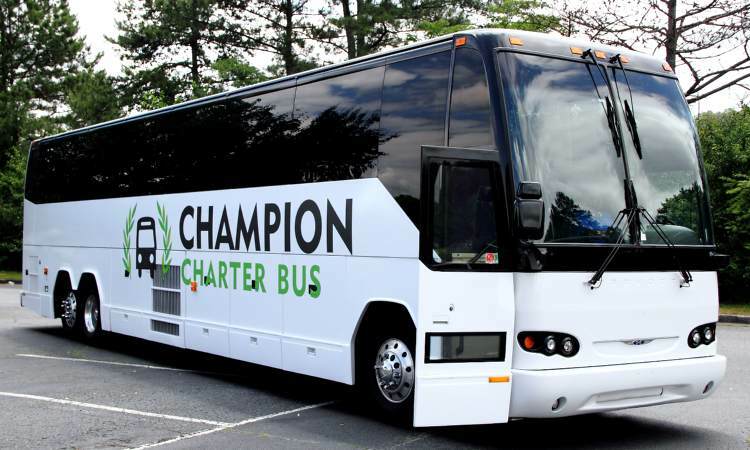 Forget stressing over organizing transportation focus on planning the perfect school trip or event with Champion Charter Bus. Because of our safety standards, schools and colleges across the West depend on us for dependable bus rentals for field trips, campus tours, away games, and more. Inspire students with a comfortable and entertaining ride to your field trip to Butterfly Wonderland. With a certified driver to handle all your transportation needs, you and students can fully focus on bonding and learning with one another. Amenities like flat-screen TVs, DVD players, and on-board restrooms will ensure students and chaperones remain comfortable and entertained the entire ride. Have an away game with your school’s sports team? Let Champion Charter Bus help you get to victory. Easily store luggage and sporting gear in your personal bus’s luggage bays, and prepare for another win without stressing over the long-distance travel. Finding the perfect charter bus rental is easy when you work with Champion Charter Bus. With the largest network of modern bus options and 24/7 customer support, we’ll handle the entire process and match you with a bus tailored to your needs. We accommodate groups of all sizes for trips of all kinds, so call us at 480-626-4771 to book today!